A company or business firm which is said to have open share capital may be incorporated as a Private Limited Company commonly known as ‘Sendirian Berhad’ or Sdn. Bhd or Public Limited Company commonly known as ‘Berhad’ or Bhd. An individual or personnel who is trusted as a member of a professional body prescribed by the Minister of Domestic Trade Cooperative and Consumerism. Both the director, board member and company secretary should have their appropriate address of residence or should be permanent resident of Malaysia. (ii) A total of RM30.00 is the paid fee for each name applied. When the applied name of the business firm in Malaysia is approved by SSM, it shall be submitted and kept reserved for 3 months from the date of approval, failure of which a fresh application for a name search must be done. An original documented copy of any official letter, note and article of association should be stamped at RM100.00. The stamps are affixed and originated at the Inland Revenue Board’s stamp office. The first directors/board members and secretaries must be named in the Memorandum and Article of Association. Share members to the company must also sign the Memorandum and Articles of Association in front of a witness. * Special NOTE: For private company limited the articles of association must contain the following stipulations. (iv) Prohibition on deposit money with the company. He or She has no involvement or has not been imprisoned for any prescribed offences. This declaration initiates that all the requirements of the CA have been complied with. 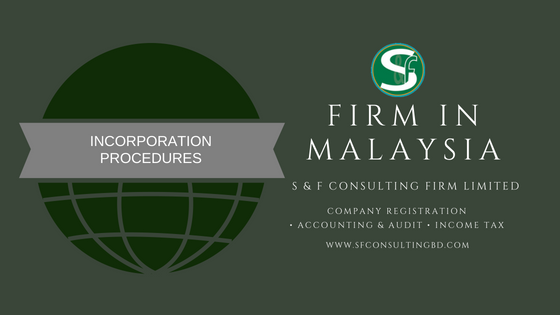 It has to be designated by the company authority body or the secretary who deals with the Private Limited Company or Sdn Bhd Company registration services and is named in the Memorandum and Articles of Association. A copy of the valid ID cards of each director and company secretary. The SSM will issue a Certificate of Incorporation upon compliance with the incorporation procedures and submission methods. The procedures, methods and Incorporation Documents for incorporation of an unlimited company is similar to that which is related to company limited by shares. The single difference that differentiate the unlimited company is that the liability of its members should be stated in the Memorandum of Association as unlimited.